An insurgency is a rebellion against authority (for example, an authority recognized as such by the United Nations) when those taking part in the rebellion are not recognized as belligerents. An insurgency can be fought via counter-insurgency warfare, and may also be opposed by measures to protect the population, and by political and economic actions of various kinds aimed at undermining the insurgents' claims against the incumbent regime. 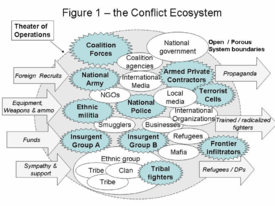 The nature of insurgencies is an ambiguous concept. When insurgency is used to describe a movement's unlawfulness by virtue of not being authorized by or in accordance with the law of the land, its use is neutral. However, when it is used by a state or another authority under threat, "insurgency" often also carries an implication that the rebels' cause is illegitimate, whereas those rising up will see the authority itself as being illegitimate. 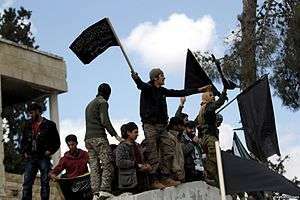 Criticisms of widely held ideas and actions about insurgency started to occur in works of the 1960s; they are still common in recent studies. If there is a rebellion against the authority (for example the United Nations) and those taking part in the rebellion are not recognized as belligerents, the rebellion is an insurgency. However, not all rebellions are insurgencies, as a state of belligerency may exist between one or more sovereign states and rebel forces. For example, during the American Civil War, the Confederate States of America was not recognized as a sovereign state, but it was recognized as a belligerent power and so Confederate warships were given the same rights as US warships in foreign ports. 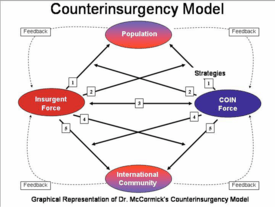 Before one counters an insurgency, however, one must understand what one is countering. Typically the most successful counterinsurgencies have been the British in the Malay Emergency and the Filipino government's countering of the Huk Rebellion. In the Philippine–American War, the U.S. forces successfully quelled the Filipino insurgents by 1902, albeit with tactics considered unacceptable by the majority of modern populations. 1 2 Oxford English Dictionary second edition 1989 "insurgent B. n. One who rises in revolt against constituted authority; a rebel who is not recognized as a belligerent." ↑ These points are emphasized in many works on insurgency, including Peter Paret, French Revolutionary Warfare from Indochina to Algeria: The Analysis of a Political and Military Doctrine, Pall Mall Press, London, 1964. ↑ Roberts, Adam and Timothy Garton Ash (eds. ), Civil Resistance and Power Politics: The Experience of Non-violent Action from Gandhi to the Present, Oxford University Press, 2009. See . Includes chapters by specialists on the various movements. ↑ Hall, Kermit L. The Oxford Guide to United States Supreme Court Decisions, Oxford University Press US, 2001 ISBN 0-19-513924-0, ISBN 978-0-19-513924-2 p. 246 "In supporting Lincoln on this issue, the Supreme Court upheld his theory of the Civil War as an insurrection against the United States government that could be suppressed according to the rules of war. In this way the United States was able to fight the war as if it were an international war, without actually having to recognize the de jure existence of the Confederate government." ↑ Staff. Bureau of Public Affairs: Office of the Historian -> Timeline of U.S. Diplomatic History -> 1861-1865:The Blockade of Confederate Ports, 1861-1865, U.S. State Department. "Following the U.S. announcement of its intention to establish an official blockade of Confederate ports, foreign governments began to recognize the Confederacy as a belligerent in the Civil War. Great Britain granted belligerent status on May 13, 1861, Spain on June 17, and Brazil on August 1. Other foreign governments issued statements of neutrality." ↑ See, for example, Franklin Mark Osanka, ed., Modern Guerrilha Warfare (New York: Free Press, 1962): Peter Paret and John W. Shy, Guerrilhas in the 1960's (New York: Praeger, 1962); Harry Eckstein, ed., Internal War: Problem and Approaches (New York: Free Press, 1964); and Henry Bienen, Violence and Social Change (Chicago: Chicago University Press, 1968). ↑ Examples are Douglas Blaufarb, The Counter-Insurgency Era: U.S. Doctrine and Performance (New York: Free Press, 1977), and D. Michael Shafer, Deadly Paradigmes: The Failure of U.S. Counterinsurgency Policy (Princeton: Princeton University Press, 1988). ↑ Oxford English Dictionary second edition 1989 brigandry "1980 Guardian Weekly 28 Dec. 14/2 Today the rebels wound, mutilate, and kill civilians: where do you draw the fine line between subversion and brigandry?" ↑ Ticehurst, Rupert. 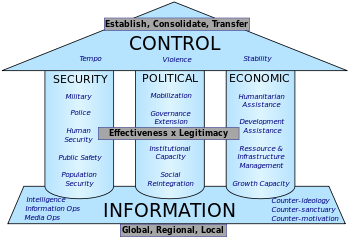 The Martens Clause and the Laws of Armed Conflict 30 April 1997, International Review of the Red Cross no 317, p.125-134 ISSN 1560-7755. Ticehurst in footnote 1 cites The life and works of Martens are detailed by V. Pustogarov, "Fyodor Fyodorovich Martens (1845-1909) — A Humanist of Modern Times", International Review of the Red Cross (IRRC), No. 312, May–June 1996, pp. 300-314. Also Ticehurst in his footnote 2 cites F. Kalshoven, Constraints on the Waging of War, Martinus Nijhoff, Dordrecht, 1987, p. 14. 1 2 Huntington, Samuel P. (1996). The Clash of Civilizations and the Remaking of World Order. Simon & Schuster. ISBN 0684811642. ↑ Headquarters, Department of the Army (22 February 2011) [27 February 2008]. FM 3–0, Operations (with included Change 1) (PDF). Washington, DC: GPO. Retrieved 31 August 2013.